Of course we all want that race day bling. But there are lots of other good reasons to race that make it great whether race medals are hanging at the finish or not. Here are four good reasons Team ECRP likes to show up at the start line when there isn’t something shiny. Give back. There are two ways you can give back to the running community through a race. You can volunteer before or during the event or run it for charity. Heck, you could even do both. There wouldn’t be any races if it weren’t for volunteers. They provide everything from packet pick-up to water stops and handing out those precious race medals. If no one volunteered, paid help would sky rocket the costs for both participants and race directors, making it so expensive most of us couldn’t afford to race. Another great way to give back is to run for charity. Usually you’re able to make a donation at the end of your paid registration but at lots of events your registration, and maybe some other goodies, are comped if you raise a certain amount of funds for a designated charity. Test yourself. Even if you aren’t running for a PR, racing is a valuable training tool. The excitement and atmosphere of race day push you beyond your normal workouts. It’s a good way to check in on how your training is going and if you’re getting more fit. Make friends. Runners come from all over to run all kinds of events. Thousands of them are trying to run a race in each of the 50 states (and collect those race medals). Races are a wonderful place to make local or far away friends. From finding yourself paired up next to someone running the same pace to standing in post race party beer lines there’s always someone new to chat with. Because, of course, runners love to talk about running. Change your scenery. Roads close for races and if you ever want the chance to run down the Las Vegas strip without getting run over, you’ll need to sign up for this race. With roads shut down or usually private property opened up for racers, participating in an event can give you special access. Some of the views and scenery are definitely worth the price of entry alone. 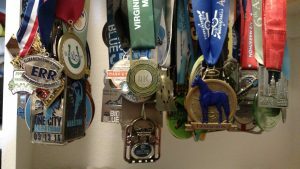 This entry was posted in Racing, Running and tagged charity running, marathon, marathon entries, race day, racing, running, scenic races on July 3, 2017 by Coach Meredith.